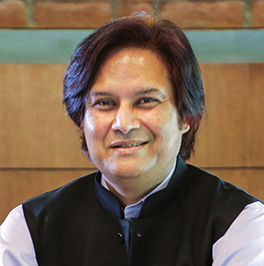 Dr. Shailendra Raj Mehta is the President and Director, MICA and Distinguished Professor for Innovation and Entrepreneurship at MICA. Before joining MICA, he was the Chairman of the Board of Management at Auro University where he also served as Acting Vice Chancellor and Distinguished Professor of Strategy and prior to that Provost/Vice Chancellor of Ahmedabad University. After a 16-year stint at Purdue University where he taught Economics and Strategic Management, he returned to India in 2006-07 to head the collaboration between Duke CE (Duke University’s Corporate Education Arm) and IIM-Ahmedabad as its head for India, West Asia and the Middle East and simultaneously as Visiting Professor of Business Policy at IIM-Ahmedabad. Dr. Mehta has done extensive research in the areas of Entrepreneurship, Industrial Organization, Information Economics and Experimental Economics. His research was the subject of a full-length review by The Economist. His work on creating world-class universities has been discussed around the world and profiled in over ten languages including Chinese, Russian, French, German and Arabic among others. He has also done groundbreaking work in the area of Synthetic Economies by creating a comprehensive framework for agent-based research using a combination of human and artificial agents. The technology has been used worldwide to model Social, Political, Economic and Security Issues. To commercialize the SEAS technology, in 1999 he co-founded SEAS LLC/Simulex, a successful high-tech company in Purdue Technology Park, which he helped run while teaching full time at Purdue. Currently he is involved in and actively mentors another Fintech startup. Dr. Mehta has authored and co-authored several proposals that brought in over nine million dollars of research funding to Purdue University from the National Science Foundation, 21st Century Fund, Microsoft, Intel and others. He has been on over 25 doctoral dissertation committees. He is also an award-winning teacher, having successfully taught undergraduate, masters and doctoral students. He has been awarded one of Purdue University’s highest awards, the Class of 1922 Award for Teaching, Innovation and Helping Students Learn. For six years he led Purdue’s Entrepreneurship Initiative as part of which he organized the flagship Entrepreneurial Competition and in the process worked with over two hundred teams of students on their business plans, several of whom went on to get venture funding. The program that he set up was rated among the top programs in the world. Over the years, Dr. Mehta has consulted with and taught senior executives worldwide including executives from North America, Europe, Africa and Asia (including CEOs in Pakistan). The companies that he has worked with include Bharat Petroleum, Black Management Forum of South Africa, Eli Lilly, Genpact, Honeywell, IBM, Infosys, Lockheed Martin, Medtronic, Microsoft, P&G, Price Waterhouse Coopers, State Bank of India and the Tata Group, among others. He has conducted long-range scenario planning, envisioning and simulation exercises with a wide variety of executives in government and in industry. He has been a member of numerous high-powered committees convened by the Government of India. He has conducted several programs for senior civil servants including IRS, IFS and IAS officers, including one for all Secretaries to the Government of India. According to a recent paper by Sahoo, Singh, Mishra and Sankaran (2015) from IIM-Bangalore and XIM- Bhubaneswar, in terms of the global impact, he is rated as one of the top researchers in the field of Strategy in India. At IIM-Ahmedabad he continues to teach a popular course on Strategy Execution and the Art and Science of Creating High Performance. He has published widely, including several papers (single and co-authored) in the ADBC, A and A* categories as well as the FT50. He has his Bachelor’s and Master’s degrees from Delhi University (St. Stephen’s College and Delhi School of Economics, respectively), M.Phil from Balliol College, Oxford, and Ph.D. from Harvard.